Foods with zinc are critical components of a healthy body and mind. Zinc is an essential element that is key to good health and metabolism, so much so that even a small zinc deficiency can cause many problems including hair loss, eye and skin lesions, loss of appetite, slower wound healing, and a weakened immune system. The libido also takes a hit when there is a deficiency because zinc helps with the production of testosterone. Taking a zinc supplement when battling the flu, a cold, or an infection can give your body the extra boost it needs to fight those illnesses. The recommended dietary allowance of zinc is eight milligrams per day for women and 11 milligrams per day for men. When it comes to foods with zinc, eating animal sources, vegetables, and fruits with zinc is a good way to get to those daily values required for optimal health. Overall, most fruits do provide some level of zinc, but there are only a few fruits that can be considered heavy hitters. Those fruits rich in zinc should be consumed more often, especially if you’re a vegetarian and are avoiding the zinc-rich sources found in meat and oysters. Zinc from fruits does not get absorbed easily because of the high phytic acid content in plant proteins. 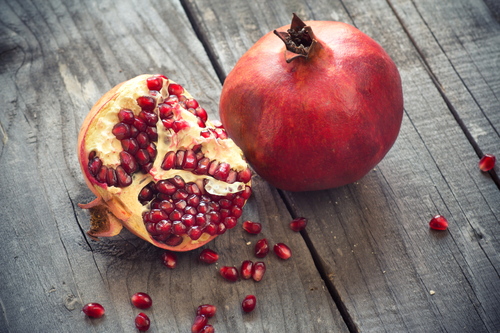 Pomegranates are a fantastic source of zinc, and as a bonus, they’re fun to eat too—once you get the hang of it. You can add the seeds to salads or just eat them by the handful on their own. Avocados (yes, the avocado is a fruit; it has a seed) offer a good source of zinc in one medium-sized fruit. Other fruits that are good to eat for zinc include blackberries, raspberries, and loganberries. Loganberries aren’t common, but look around and you might be able to find them at a good market or produce store. Dates are also a good source of zinc. What about dairy foods with zinc? Dairy products are also good food products with zinc. Basically, eating any type of cheese, whether it’s from a cow, a goat or even a sheep, plus some kinds of yogurt, and whey products will deliver a decent amount of zinc, and again, when combined with other foods that are high in zinc, the amounts will add up to match the recommended dietary allowance. Below is a list of some dairy sources that are high in zinc, in order from highest to lowest. Meat eaters, or non-vegetarians, have the easiest time at getting high levels of zinc into their diet because meat is, without a doubt, the best way to get zinc in one serving. Oysters are, by far, the most potent form and therefore the top food source for getting zinc into your diet. So if you can eat shellfish and enjoy it, then eating oysters is the best thing you can do where zinc is concerned. Getting zinc into your diet, whether you’re a vegetarian or a meat-eater, is critical to good health. Our immune systems need zinc to properly defend against viruses and bacteria that can cause infection and illness. We need zinc so that cells can properly metabolize food. To maximize your intake of foods with zinc–try eating foods from a variety of zinc sources so you not only benefit from the intake of zinc, but from all the other nutrients and minerals those foods will deliver to your body. Wonderful meals can be made from the foods listed above, so mix and match as much as possible. If you don’t eat meat, it will be harder and will take more consideration, but it can be done. “The Top 10 Foods Highest in Zinc,” HealthAliciousNess web site; https://www.healthaliciousness.com/articles/zinc.php, last accessed March 10, 2016. “13 Zinc Rich Foods,” Health web site; http://www.health.com/health/gallery/0,,20929453,00.html, last accessed March 10, 2016. “Vegetables and Fruits Highest in Zinc,” Healthy Eating web site; http://healthyeating.sfgate.com/vegetables-fruits-highest-zinc-4940.html, last accessed March 10, 2016. “Fruits High in Zinc,” Livestrong web site; http://www.livestrong.com/article/538917-fruits-high-in-zinc/, last accessed March 10, 2016. “Dairy Products and Eggs High in Zinc,” Foods-High-In web site; http://foods-high-in.net/foods-high-in-zinc/dairy-products-and-eggs,1.html, last accessed March 10, 2016. “Foods Highest in Zinc,” Self Nutrition Data web site; http://nutritiondata.self.com/foods-001124000000000000000-1w.html, last accessed March 10, 2016. “26 Foods High in Zinc for Overall Good Health,” Bembu web site; https://healthwholeness.com/vitamin-rich-foods/foods-high-in-zinc, last accessed March 10, 2016.